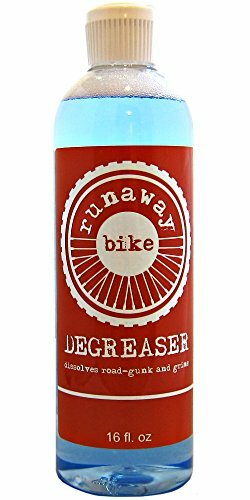 Our brand new product, runaway bike degreaser uses a biodegradable formula that attacks and breaks down road-gunk for easy cleaning. It's safe for rubber seals on hubs, headsets, bottom brackets, and suspension components. Perfect for maintenance of carbon fiber, titanium, aluminum, steel, chrome, rubber, paint, and plastic. Not citrus-based, so it's safe for your bike's paint. You can rest assured that your precious riding companion is protected. Relubricate as needed after degreasing. If you have any questions about this product by Runaway Bike, contact us by completing and submitting the form below. If you are looking for a specif part number, please include it with your message.